• 36 Wall Hangings (in any medium) that may or may not be framed. • 31 Bed Throws (eg. cotton bed runners with Tla’amin or Native design). We look forward to creating a cultural environment at the hotel that we can be proud of. Please feel free to contact Anthony Williams at: anthonywilliams444@gmail.com or call the TMSLP office at (604)483-7777. Incorporated in 1995 and originally called the Sliammon Development Corporation, the SDC was created to engage in and oversee economic development for the Tla’amin Nation. After the effective date of the Tla’amin Treaty, SDC was re-organized and Tla’amin Management Services LP became the business arm of the Tla’amin Nation. 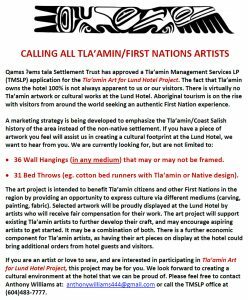 With over 20 years of experience in conducting business, particularly in land development, forestry, aquaculture, retail, hospitality and tourism, the Tla’amin Nation looks forward to working with you!